Tentu Pass (4996 meters) a mixture of snow, ice and rock with the gradient up to 75° to 80°, which makes the climb difficult and exhaustive. It can be seen from Beas Kund and Bakarthach and serves as a base camp for climb up to Hanuman Tibba (6001 meters) and other surrounding peaks. Climb to Tentu Pass is an achievement in itself as it's one of the highest passes of the region and entire Kullu Valley and Pir Panjal mountain ranges are visible here. The trekker can also view beautiful peaks like Hanuman Tibba, Shitidhar, Friendship Peak and Ladakhi Peak from close. It's not an easy climb and climber needs to be experienced and carry all professional gear like Ice Axe, snow shoes, Crampons and ropes etc to climb this summit. We will make arrangements to make your climb successful. We reach Solang Valley today and enjoy the beautiful views of the valley. Nearby is the Atal Bihari Mountaineering and Allied Sports Institute's Ski Training Center. We will visit Anjani Mahadev Temple as well which is a few kilometers walk from here. With beautiful views and a 100 feet waterfall falling over a Shiva Linga. The view is breath-taking. We will click pictures and pay our obeisances to a nearby Ashram. We rest and camp here today. Way to Bakarthach is a little more steep and tiring as we climb up over stones and moraines as well as cross small rivulets. The last leg is little steep and tiring. Finally we reach our beautiful camp site at Bakarthach which is surrounded from three sides by Majestic Mountain Peaks, On our left would be Hanuman Tibba (5892 meters), Shitidhar Peak (5250 meters) and on our right would be Friendship Peak (5300 meters), Ladakhi Peak (5345 meters) etc. Its an amazingly beautiful panaromic view to satisfy the trekker in you. There some stone shelter and availability of water and wood. We camp here tonight among beautiful stars with bonfire and some music. Today we climb towards Beas-Kund (3550 meters), It's a little stiff climb and the route is through boulders and rocks in summers & through snow in winters . After a trek of 4-5 hours we will see the beautiful lake of Beas Kund . This lake is believed to be the source of River Beas. 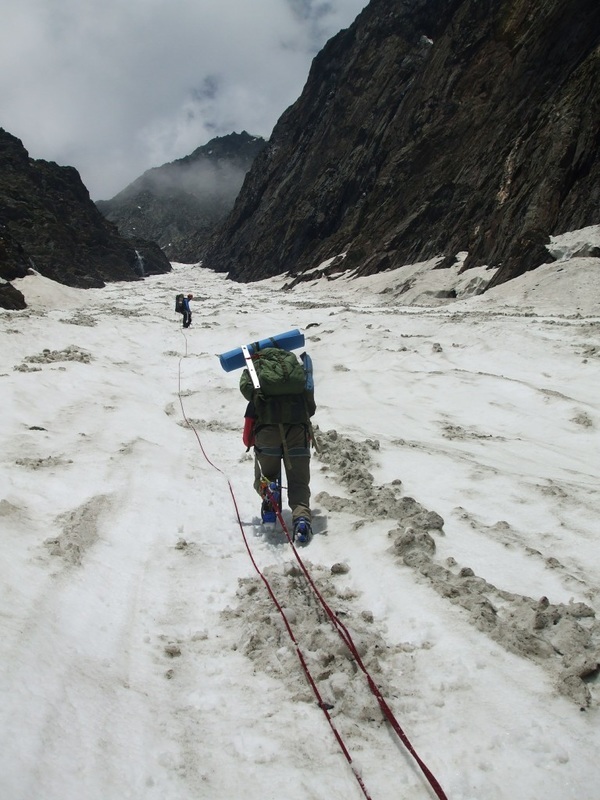 Beas kund is also the base camp for summit peaks like Friendship, Ladakhi & Shitidhar. Our today's Camp will be near Beas kund . There's a steep climb up to Tentu Pass as we reach to the top. It presents Panaromic view of Kullu Valley and Pir Panjal Mountian Ranges. Trail descends to Balu Got a camping ground which is 10 kms from Tentu Pass. We camp here tonight. The trail passes through various pastures oftenly used by Gaddi Shepherds, We cross Koari Got (Camping Ground) before reaching Phulan Got, It's quite a steep climb from up there but it's well worth it since the views from Phulan Got are just too awesome and you will feel fresh after the climb. We camp here at Phulan Got tonight which is located beautifully amids glaciers and high peaks at 4000 meters. A day trek involves walking on Moraine on confusing trails. We ascend steep towards the next mountain range for Manali Pass. 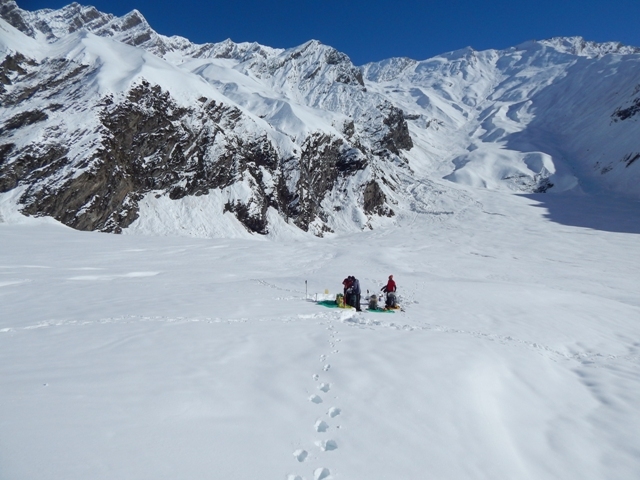 We reach the camp which is at the snout of Taintagiri glacier below the pass. We camp here tonight. We climb up to the Base of Manali Pass and see beautiful views of peaks of Indrasan (6220 Meters), Hanuman Tibba (5982 meters) and Deo Tibba (6001 meters) from close. We rest here for a while and then climb down towards Rani Sui (4268 meters) campsite. As we prepare to camp here for tonight. It will be a steep descent from Rani Sui towards Bogi Thach and Kalath. From Kalath our jeeps will pick you up and drive you down towards your hotel in Manali. Click here to know more on whats included and what you need to bring along?